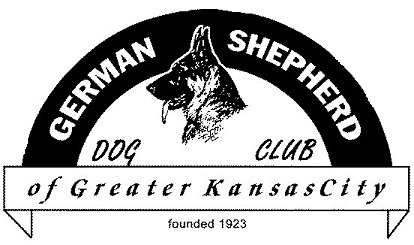 Founded in 1923, the German Shepherd Dog Club of Greater Kansas City has a long and successful history in the Greater Kansas City Metropolitan area. Our club members are from different parts of the city and out of state. Our interests and activities are as diverse as our wonderful breed. Our members include those with family companion dogs wishing to socialize with other German Shepherd owners, learn more about the breed, and best care practices for their four legged family members! Many are also exhibitors in obedience, rally, agility, tracking, nose work and working dog sport/IPO. We are also fortunate to have some of the nation's top ranking dogs, in both performance and conformation, as well as their owners, represented by our club! Our club's objective is to offer knowledge and education within a relaxed social atmosphere at our monthly gatherings. We invite interesting speakers and offer monthly programs directed at making the most of our daily lives with our dogs. You are invited to join us at a club meeting. We meet at 7 p.m. on the second Tuesday of each month. January - April we meet at the North Kansas City Parks & Recreation Center at Macken Park, 1201 Clark Ferguson Drive, North Kansas City, MO. The meetings during the months of May - September are held outdoors and the location will be posted on the Upcoming Events calendar. There is not a meeting held in October. November and December meeting information will be posted on the Events Calendar. Join us on Facebook www.facebook.com/gsdcgkc or Twitter www.twitter.com/gsdcgkc for Canine Health News, Meeting and Event reminders and more.